Recently I wrote about how I consider safe entry and exit points and possibility of swimming at all tide times to be a critical requirement of a good open water swim location. Kids growing tend to think the whole world is the same as their local experience. Though I didn’t live by the coast growing up, it never occurred to me that the seashore was different in other places. 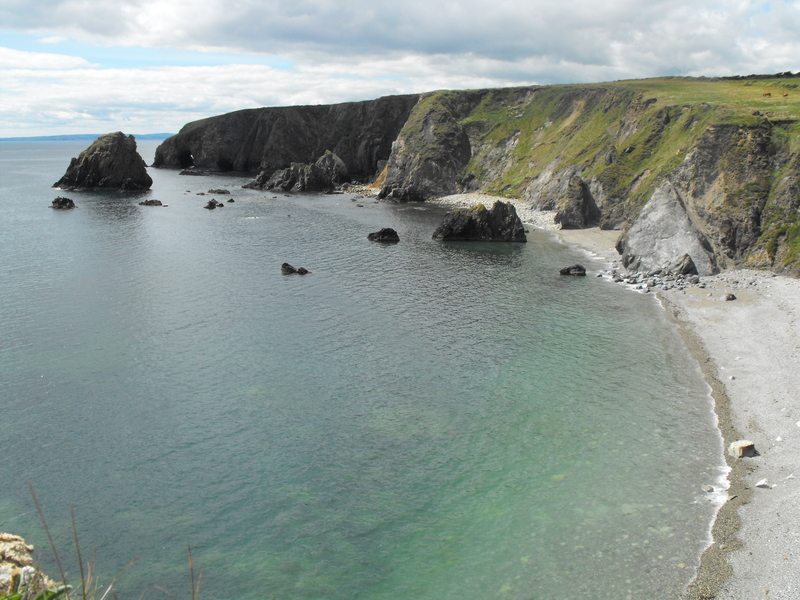 In Ireland, if you were visiting a new beach, you knew you had to be careful of incoming tides and of not being cut off. The first time I visited the Mediterranean I was really surprised by how little the tide seemed to move. So even now I tend to forget that tidal access and depth is not an issue in many places in the world. But it’s far safer for someone who comes from a high tidal range location to travel to a low range area than the opposite. Many people now know the Bay of Fundy in Canada has the world’s highest tide, due to estuarine forcing (pushing more water into a smaller space), with a height of up to 15 metres and the lowest tidal regions are called amphidromes, with no height change. Tidal range is the height difference between low tide and high tide. The tidal range in Ireland averages six metres. This is called a Macromareal tide, a tidal range above four metres. The average open ocean tidal range is only just over half a metre. And the Mediterranean is micromareal, less than two metres range. In between, from two to four metres range is mesomareal. Why this is the case I explained a long time ago in Tides for Swimmers, Part One and Part Two. In the English Channel the range about seven metres. Even average is misleading. 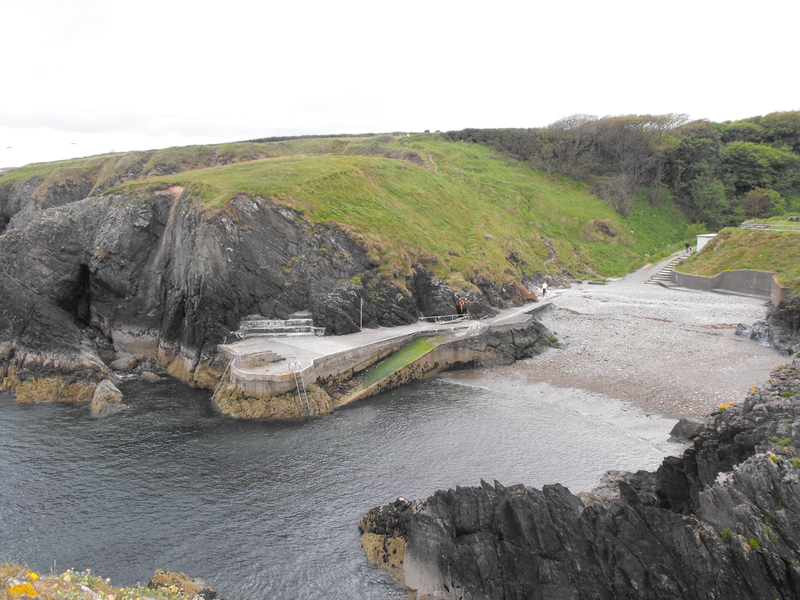 During a low neap tide, the range in Ireland can be as little as four metres. During a high it can be as much as seven metres. 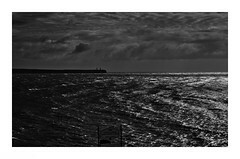 In Ireland on a neap tide the low will not drop to as low as the open water mean of 0 metres, but might only drop to 1.3 metres, and will only go up to over just over 4 metres, whereas during a spring tide, the range may be from 0.0 metres to over during the spring spring and autumnal spring tides. Spring spring is not a mistake, it the spring tides that occur during spring. 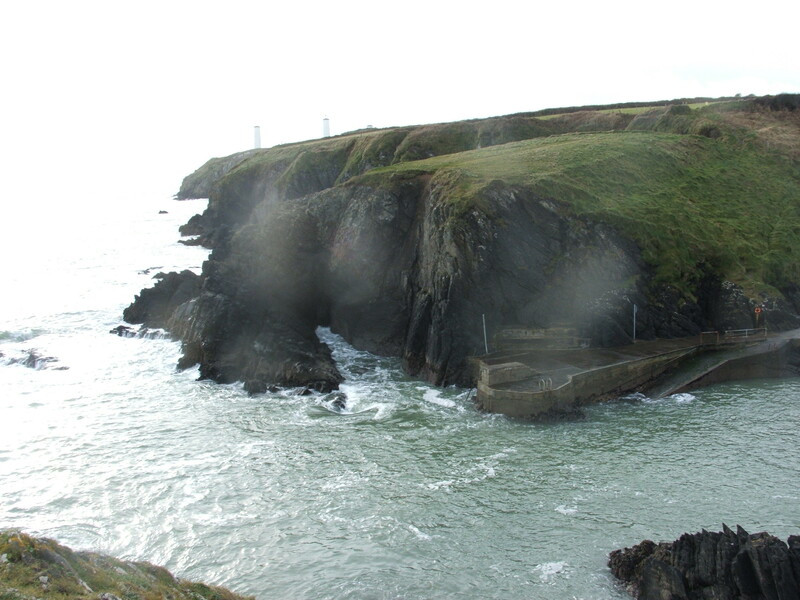 Today in fact is a neap tide, and in Tramore the neap tide is 0.5 metres and the high tide is 4.2 metres. There are a few serious safety implications of this. Will you have a planned known safe exit if the water is going to be a different height to when you start swimming? What will be the effect of the tidal current where you are swimming? The greater the tidal range, the greater the tidal current. What different challenges will come into play on your planned route at different tide times? Will dangerous reefs appear? Will swim landmarks disappear? What happens if you show up in a new country and have no idea of the tidal range and want to swim? Well as always, first check with locals before you swim. But how do you recognise a high tidal range? The simple answer is to look for the high tide line. On a beach that will be a line of debris, twigs, leaves, kelp or rubbish or even a change in the sand quality. Don’t assume that a high tide line won’t happen the day you are swimming. Was the moon full or dark the previous night? If either, it’s a spring tide. A half-moon is a neap tide. If there’s no beach, rocks are even better indicator. The difference between the low and high tide point is called the intertidal zone. 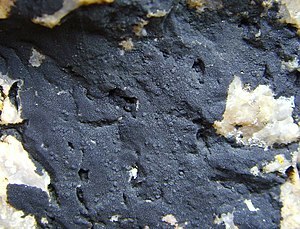 Around Ireland and elsewhere, rocks that close to the high tide mark will get covered in a salt resistant lichen, Verrucaria maura, making the rocks black. Verrucaria maura doesn’t start at the low tide mark by the way, it generally starts at about the mean high tide point, HWA. The rocks beneath the low tide point will retain their original colour, the rocks above the high tide line will often be yellow or orange with less salt resistant lichens such as Xanthoria parietina or Caloplaca marina, all of which are visible in my Copper Coast Swims. Of course sometimes the rocks are dark anyway, but high tide lines are easy to see. 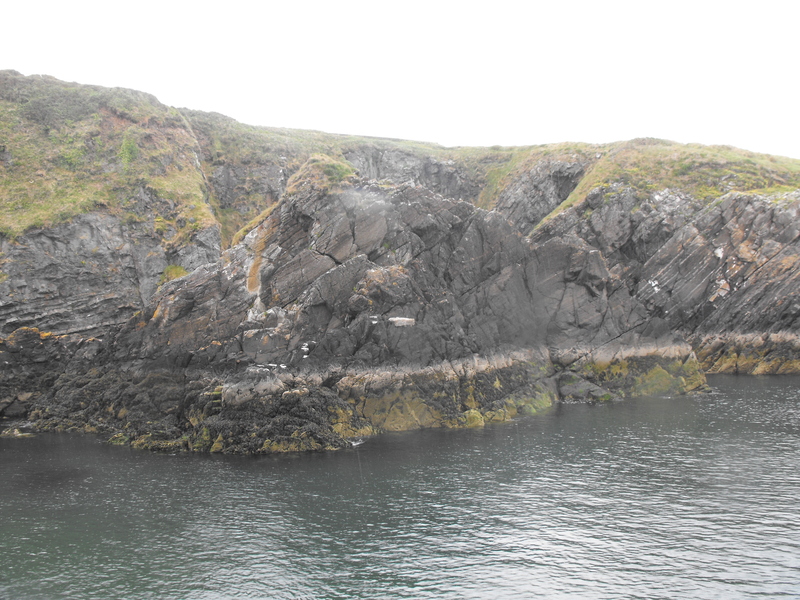 Here are the rocks on the far side of the Guillamene Cove at about mid tide. It is still difficult to appreciate just what that range can mean. So … some more photos I’ve taken. Here’s the Guillamene from the cliff top road. At low NEAP tide, all the steps are exposed. 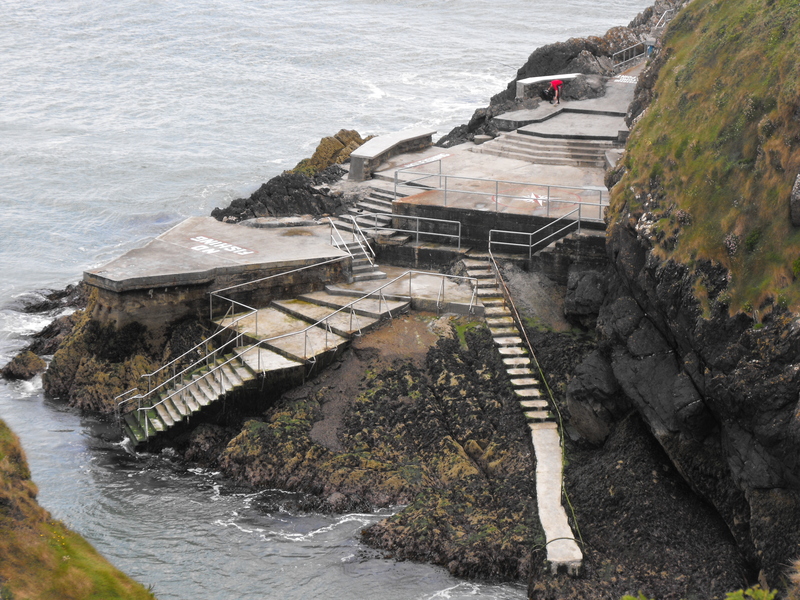 At low SPRING tide, there’s a ladder below the steps which is exposed to about 4 or 5 steps. Look at the colour range of the rocks. At the lowest point and up they are a sandy limestone colour (and covered in barnacles) and get blacker as they get higher. 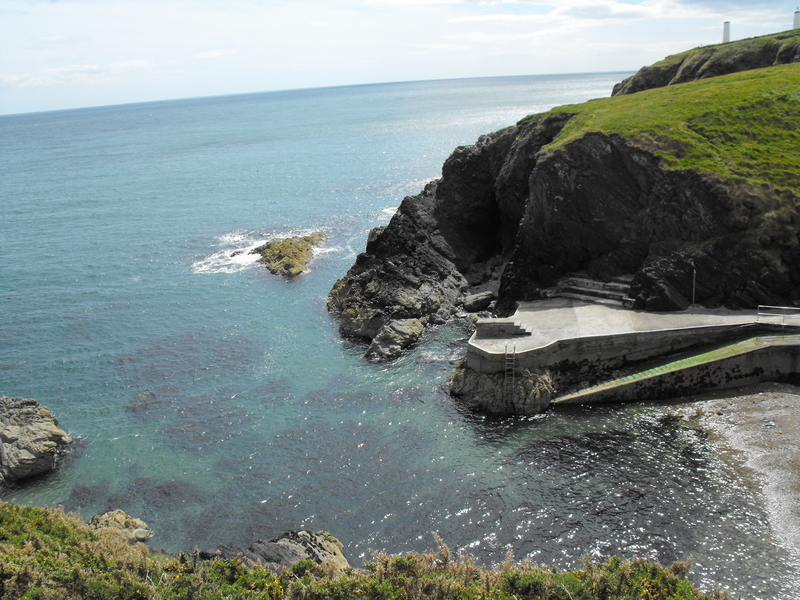 On a high spring tide, without any wind, the water reaches to just under the front triangular platform. Just above that line the rocks are completely black from the lichen. Newtown Cove at high neap tide. And at about mid tide. And low tide. From this vantage point it might not look like much. But if you look at the full size image, you can see that there is a ladder exposed on low tide. Considering hazards, this photo below of the west end of Kilfarassey gives an indication. With the tide only about one metre below high in this image, various reefs are starting to appear. Almost all are covered at high tide, some of them only centimetres below the mean high water surface on a calm day. A 6 metre tidal range (almost 20 feet) is the height of a house, three times the height of a tall person. It’s very very significant. So be safe, and take note of the conditions, tide and tide range and plan accordingly. Hi Donal, you have a Facebook share button on your blog. If I click that it posts the link with a short extract onto our Facebook page linking back to the source, so anyone who wants to read the full article is directed back to your blog page. I’ll send you a screen grab by email so you can see. Regarding writing something for H2Open, it’s not a case of not being interested. It’s finding a suitable story angle that fits the theme of a particular issue. We admire your writing which is why we’ve featured your blog in the magazine. Best wishes. Thanks for explaining Simon, appreciate it. Hi Donal, nice piece. I’ve shared it on our Facebook page. Best wishes, Simon. Thanks Simon. Since I’m not on Facebook, does that mean you cut and pasted it or put a link to here? Everything written here is Creative Commons-licensed which mean there’s must be attribution to the source. I have previously offered to write for H20, but there was no interest. I am also aware that my blog has featured in the magazine since then, so I’m a bit confused. This is a really good post – very informative and Interesting. Thanks Charlotte. Sometimes we forget the obvious to us isn’t to others..